The First World War was the cause of dramatic changes in every Canadian community. 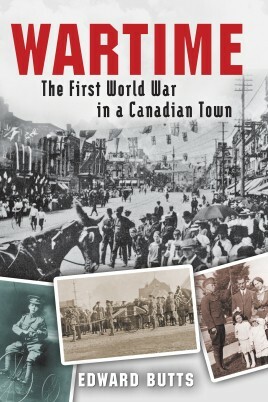 What it meant to daily life becomes clear in this book about the war years in Guelph, Ontario. The first months were the easiest, as young men rushed to enlist. Once news of casualties and deaths started arriving, the atmosphere changed drastically. Mothers dreaded the arrival of the telegraph boy. Newspapers published fulsome obituaries which could not obscure the tragedy of their deaths. Tensions emerged — one compelling example being a secret military and police night-time raid on a Catholic seminary just outside the town, looking for young men hiding from conscription.With these stories, Edward Butts offers a compelling portrait of people trying to make sense of a war with little evident logic. His account helps explain why the cause of the League of Nations and efforts to ensure peace in the 1920s and 1930s were so powerful amongst Canadians who had learned about the real impact of wartime on ordinary people.Through the use of primary resources including articles from the local press, letters from overseas, and newsreels in the cinema, Butts captures the reality of the First World War for Canadians at home.